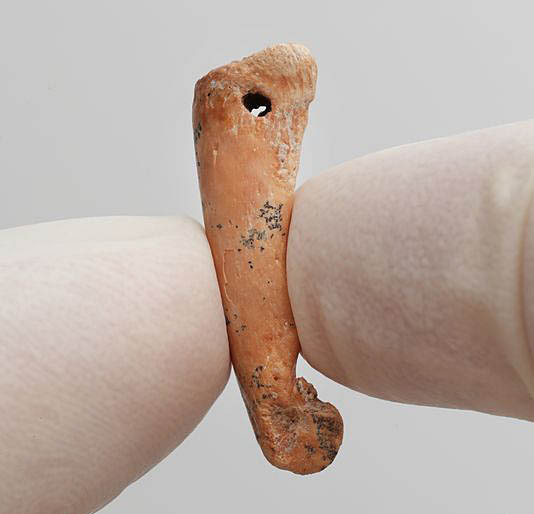 Newly discovered pendants and beads fashioned from the bones of "pig-deer" and monkey-like marsupials suggest that the Ice Age inhabitants of Indonesia had a flourishing artistic culture. A team of archaeologists from Australia and Indonesia discovered the artifacts at Leang Bulu Bettue, a cave and rock shelter on Sulawesi, the largest island in Wallacea. One of the more fascinating items in the cache is a pendant made from the finger bone of a marsupial known as a bear cuscus. Believed to be 26,000 years old, the drilled and perforated bone was designed to hang from a string. Wear marks seem to indicate that the ornament repeatedly rubbed against skin or clothing. 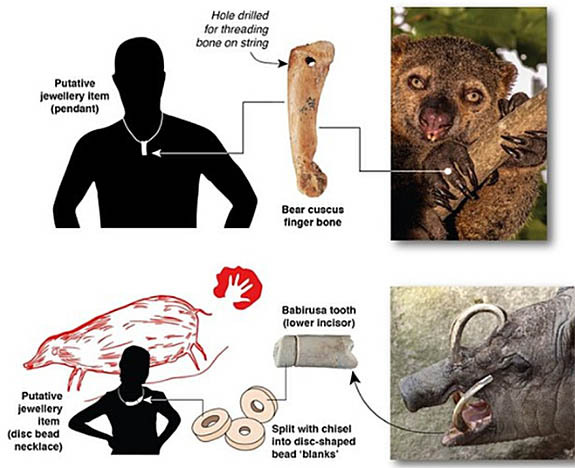 Other jewelry items found in the cave included a batch of disc-shaped beads made from the teeth of a babirusas, a boar-like animal also known as a "pig-deer." Interestingly, the land mammals of Sulawesi occur nowhere else on earth, a phenomenon called "endemism." Archaeologists previously believed that the Ice Age hunter-gatherers living amidst this stretch of islands between Southeast Asia and Australia were less sophisticated than their European counterparts. However, mounting evidence is forcing them to modify their thinking. Found on the Leang Bulu Bettue site, for example, were mineral pigments, such as red- and mulberry-colored ochre, as well as a hollow bone that could have been used as a primitive airbrush. These items help paint a picture of a culture that was sensitive to art, beauty and personal adornments. 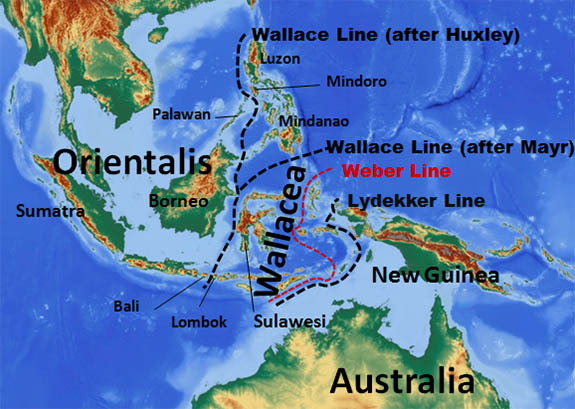 The scientists from Griffith University's Australian Research Centre for Human Evolution (ARCHE), along with an Indonesian team, detailed their findings Tuesday in the journal Proceedings of the National Academy of Sciences. "We uncovered abundant evidence for a variety of symbolic behavior, suggesting a flourishing artistic culture existed on Sulawesi during the tail end of the last Ice Age," study lead author Adam Brumm told Live Science. Credits: Photos and illustrations by Griffith University; Map by Altaileopard (Own work) [CC BY-SA 3.0], via Wikimedia Commons.